This article is about the M12 Warthog. For the weapon, see M12. "The Warthog is as much a part of the UNSC as boots, guns, and tasteless coffee." The M12 Force Application Vehicle (M12-FAV), more commonly known as the Warthog or simply the Hog, is the United Nations Space Command Armed Forces' primary joint light tactical ground vehicle. ; its variants are capable of performing armament carrier, utility, command and control (shelter), ambulance, reconnaissance and a variety of other tactical and logistic support roles. It is a highly mobile, all-wheel-drive, all-wheel-steering, hydrogen-injected ICE-powered vehicle equipped with a manual transmission. The most ubiquitous model are the M12 Light Reconnaissance Vehicle variants, which is equipped with advanced surveillance and a turret-mounted machine gun for a basic defensive capability. The M12 has been a part of the UNSC's mechanized infantry divisions and armored vehicle divisions since 2319, and is the most publicly recognizable vehicle in their arsenal. The M12 is a four-wheel drive, all-terrain utility vehicle capable of going over any obstacle without difficulty. Under the hood the M12's power is generated by a forward-housed low-profile liquid-cooled hydrogen-injected ICE I/C plant, coupled with an automatic infinitely variable transmission (IVT). The hydrogen fuel is burned at a very high temperature with a synthetic carbon/silicon catalyst to achieve even better fuel consumption. This hydrogen engine is the standard among all UNSC ground (and most air) based vehicles, replacing fossil fuel-based engines some 400 years ago. The M12 features a Graf/Hauptman solar/saline actuator, which is capable of converting up to twelve liters of fresh, brackish or salt water into hydrogen on the fly. Detritus from the process is compacted on board and disposed of manually by the crew. This allows the Warthog to travel 790 kilometers (490 miles) before it needs to be refueled, a range that can be easily extended by the addition of any container capable of holding liquid. Older models boast a fully independent swing-arm suspension system and four in-hub wheel motors. The M12 is a huge, unwieldy, difficult to steer vehicle—until a user learns how to drive it properly. With proper application of the hand, or "e-brake" the M12 can actually turn on a dime. Massive disc brakes and its automatic braking systems allow the vehicle to come to a near immediate, but controlled stop should the driver be ejected, or choose to leave the vehicle. The Warthog's tires have moved away from previous inert-gas pocket inflation with far more resilient and superior burst-proof single unit nanotube skeletons. They provide the buoyancy and ride of gas-pocket tires, but are almost indestructible, allowing the M12 to easily roll through situations that would leave other vehicles disabled and vulnerable. The relatively massive tires are a joint project between Michelin-Vance and AMG. The base model of the M12 has no doors and has a total seating of two or three. Its description as a "force application vehicle" is spectacularly accurate; the M12 has both offensive and defensive capabilities, as well as intel gathering and supply transport and practically any other task that can be accomplished by a wheeled vehicle. The M12 can be configured to become a troop carrier, armament carrier, ambulance, reconnaissance vehicle, or communications vehicle. All M12-based vehicles are designed to travel both on and off-road, in all weather conditions. The M12 Warthog shares parts – and handling characteristics – with the Spade and its sibling frontier trucks, which means that many recruits are already proficient with basic vehicle maintenance and off-road driving skills before they ever arrive at UNSC boot camp. Late in 2552, a second chassis, known as the M12B, was introduced. It incorporated side compartments into the body, features a more angular body style, utility bars over the hood and around the bed, and several other largely cosmetic changes, while keeping a similar design to the first chassis. This design typically carries several Jerrycans filled with water to be rendered into hydrogen for the engine. It has a lighting system of 24 LED brake light and ULED headlights. This chassis has a programmable nano-prismatic paint to refract color at any chromacity, depending on the vehicle's destination. A security bit was designed to prevent marines from tinkering with the finish, based on early and embarrassing experiences of the tech's deployment. Unlike most models used throughout the Human-Covenant War, this chassis uses a swing-axle system, a redesigned transmission and drive shafts, and constant-velocity joints. This design does not have an antenna on it, used a military alphabet stencil for the word "UNSC" on its body, has the original UNSC logo on it, and uses white paint for the arrows on the hood of the engine. In the hood, the engine has a black battery, and green chairs. This version of the M12B was stocked by the Marine forces of the UNSC Pillar of Autumn during the Battle of Installation 04 alongside regular M12 Warthogs, and were later used by forces deploying from the UNSC In Amber Clad later in the year during the battles of Mombasa and Delta Halo. The 2554 M12B Force Application Vehicle "Warthog". What is unique about this variant is that is has a SLED searchlight, has "M-12" written on the steering wheel, used the original black colored UNSC insignia, uses a military alphabet stencil for the word "UNSC" and "STEP" on its body, has a yellow battery in the hood, and has an antenna on it. It also has a side rack holding something. In the seating area this one has brown chairs with bars to reinforce them, and a health pack between the seats of this variant. Unlike other models using this chassis, this one uses a dual spring suspension to keep the vehicle stable in different environments. This model also is darker than other models. This model of the Warthog uses the post-war UNSC emblem, uses red paint for the arrows on the hood of the engine, and has a slightly darker shade of green. This chassis entered service sometime after the Requiem Campaign. It is equipped with a variety of new weapons across its variants, including the M343A2 chaingun, the M555 Gauss cannon, and the M80 missile launcher, as well as a number of experimental munitions, particularly Warthogs operated by ONI forces. What makes this model so unique from the previous ones that use the M12B chassis is that is uses an orange colored battery and lacks the overhead screen between the two seats that previous models had. It also has bars to reinforce the chairs. The M12 is the workhorse of light infantry ground vehicles, is adaptable to almost any situation, and is arguably the most customizable vehicle in the military's fleet similar to jeeps used in the 20th century. It is able to reach top speeds of 125 km/h (78 MPH) and, more importantly, swings around rapidly to allow the gunner a better angle on a prospective target. The mounted M41 chain gun can cut down heavily armored infantry within seconds, as well as shielded infantry. With enough controlled fire from the 12.7×99mm armor-piercing rounds, the M41 can easily rip through the armor of a Covenant Ghost and destroy it. The Warthog's titanium armor, though light, is tough enough to take at least one fragmentation grenade and can withstand small amounts of energy weapon fire. It also makes for a formidable scout and transportation vehicle, able to make a smooth getaway or rapid infiltration if needed. Due in part to its speed, the M12 is prone to roll over. It is vital that the driver can get in and out of dangerous situations without flipping the hard-to-right vehicle. The open nature of the Warthog always puts its driver and passengers at risk as a good marksman can easily take down the driver or passengers of the M12. A well thrown frag grenade can flip a Warthog, which will knock the driver and passenger out of the vehicle. Although the armor of the M12 is tough, a couple of direct hits from frag grenades, rounds from a sniper rifle, a well placed rocket or a lucky plasma grenade stick will destroy it immediately. Covenant heavy energy weapons are the biggest threat to the Warthog; a short burst from a Banshee's light plasma cannons is deadly, able to melt and punch through the armor with ease and kill the occupants. The Warthog is also vulnerable to the Banshee's Fuel Rod Gun which can reduce the vehicle to twisted charred metal with one strike. Infantry plasma weapons can inflict moderate damage, and, like all vehicles, can be rendered temporarily or permanently inoperable by a hit from an overcharged Plasma Pistol. In Halo: Reach and Halo 4, the M41 and M46 (respectively) LAAGs are prone to overheating, which requires the person operating the weapon to use it in short bursts. Failing to operate the weapon carefully will leave the operator vulnerable as they wait for the machine gun to cool down. Ice has also proven to be a major disadvantage, since the Warthog cannot be steered properly driving on ice due to poor tire traction. The M12 Warthog can be configured for various roles: examples include the M831 TT, which eliminates the support weapon in favor of four side-facing passenger seats; the M864A, with an enclosed passenger compartment and treads in place of wheels; or the M914 RV, equipped with a towing winch and a heavy duty motor and gear system, armament carrier, ambulance, or communications vehicle. All M12-based vehicles in service with the UNSC are designed to travel both on- and off-road, and in all weather conditions. Spirit of Fire variant - The Spirit of Fire Warthog, also known as the Fireball Warthog, is a variant used by the crew of the UNSC Spirit of Fire. This variant has a flame decal on it. A Fireball Scout Warthog gathering supplies in Halo Wars. Corp Scout Warthog - Demilitarized Warthog with extra armor used by the Liang Dortmund Corporation. Tundra Scout Warthog - A tundra camouflaged variant used by the UNSC to transport food and fuel during tundra and arctic campaigns. Features better armor than the Corp Hog. Urban Scout Warthog - An urban camouflaged variant used by the UNSC. Features better armor than the Corp Hog. Woodland Scout Warthog - A woodland camouflaged variant used by the UNSC. Features better armor than the Corp Hog. ONI Scout Warthog - The ONI Warthog features better armor than the camouflaged models and is only superficially similar to the standard military models. #550 Scuderia StarSpeed M-12R - An exemplar of heavily modified Rally Warthogs homologated for racing series across multiple systems and fitted with the latest hydrogen-burning turbines and ceramic applique armor, this Rally Warthog can handle environmental hazards that would leave even mil-spec vehicles as broken wrecks. A #550 Scuderia StarSpeed M-12R. M12 GT - The M12 GT is designed for racing competitions and features an enclosed-cockpit monocoque for increased structural rigidity. M862 Arctic Hog - The M864 Arctic Hog is designed for extreme environmental conditions and features an enclosed-cabin and quad-tracks that allow the variant to drive up icy heights or travel over deep snow. M864 Arctic - The M864 Arctic is camouflaged and outfitted specifically for expeditions in arctic conditions, but the M864 does not have the extreme mobility modifications of the M862. M868 Tropic - The M868 Tropic is camouflaged and equipped specifically for tropical expeditions. The M868 variant has improved suspension and double the regular amount of anti-corrosion coatings applied to Warthogs. M914 Recovery Vehicle - The M914 RV is a faster, stripped down version of the Warthog, built for troop and equipment recovery. It is particularly used to extract Warthogs that had been damaged in battle or as a mobile repair bay. An M12 Warthog LRV runs over a Jiralhanae Warlord during the Second Ark Conflict in Know Your Enemy. AMG Transport Dynamics designed the first Warthog prototype in 2319, dubbed the "Z-12". The Z-12 prototype vehicles quickly proved to be popular due to a well-crafted advertising campaign and adept engineering team which demonstrated the prototype's impressive feature set and unparalleled functionality in the unpopulated remote territories of both Luna and Mars. AMG claimed that the vehicle that could "go anywhere and do anything". Within the first eight months of the Z-12 prototype's existence, AMG received over three dozen exclusivity contracts. Most of these contracts came from the Colonial Military Administration. By 2321, AMG Transport Dynamics worked with the CMA and established a deal to cover all of their land-based transportation needs. Around the time of this deal, the Z-12 became integrated into the M12 Force Application Vehicle. In addition, a pneumatically-powered swivel mount and armored body panels were added to the vehicle. By 2329, the M12 FAV had become the most common all-terrain vehicle in service with the military—closely followed by the Mongoose and Civet vehicle lines that were also produced by AMG. CMA personnel began to refer to the M12 as the "Warthog", first establishing the vehicle's nickname. Eventually, the Warthog was adopted by the United Nations Space Command. 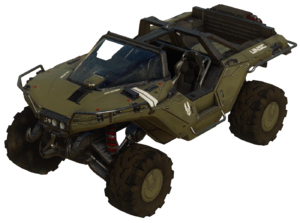 More than a dozen iterative changes were added to the Warthog, and over two centuries later, after its original creation and design, the M12 Warthog remained the standard utility vehicle in UNSC service. Due to how commonplace the Warthog is, all UNSC personnel are required to know how to operate and maintain an M12 Warthog, regardless of military speciality or branch of service. "It's [the M12] sort of a bear to wheel around, but that's something you gotta expect – the thing is twice the size of my granddad's car – but it's something you get used to pretty damned quick." "On the battlefield speed is life and the M12 has that in spades – having a great big damn gun don’t hurt, either." "I have yet to come up against an obstacle that the Warthog couldn't go right over." "The Sarge hates it when we ram stuff, says the 'Hog ain't indestructible. But it sure feels like it when you're plowing through a crowd of startled Grunts, though." "The seats are unreal! I was thinking of pulling a set out of a parts vehicle and shipping them home...but the wife shut it down – says everyone would be able to tell where they came from." "Look at these legs – pretty nice, huh? It’s totally from getting in and out'a the 'Hog's thirty-six inch damn step height." 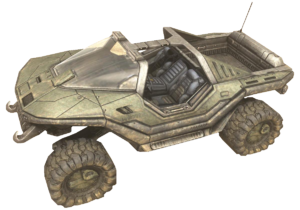 The Warthog was originally going to be a Humvee-like vehicle in the early stages of development of Halo: Combat Evolved. WETA Workshop, based in New Zealand, built a two-third-scale, operating Warthog. It has several numbers on it, some possibly pertaining to that specific model or maybe even that specific Warthog, including, but not limited to, 5c8611, N/AAV-20 (a label similar to the M/AAV-20 that can be seen on the Halo Reach-era Warthog), and others. WETA's Warthog is almost accurate in every function, including a "working" minigun, four-wheel steering, digital displays, air bags, and the ability to "crab crawl". Stamps portraying the number and type of Covenant troops killed can be seen on the dash. This Warthog is featured in the Halo: Landfall live-action film series. Some Bungie employees were given the chance to drive WETA Workshop's Warthog. Three members of the Bungie team were driving the Warthog around a parking lot when they scraped the side of it on a small wooden structure built onto the side of a wall. During Halo 2's development, Bungie considered creating more specialized Warthog variants including arctic, transport, and jungle models. The first two models were later featured in Halo 3 as the M864 Arctic and the M831 Troop Transport, respectively, while the latter model was named in the Halo Encyclopedia as the M868 Tropic. A warthog is a wild member of the pig family that lives in Africa, in keeping with the UNSC's tradition of naming ground-based vehicles after real animals, with the exceptions of the Cyclops and Gremlin, which are named after mythical creatures. A remote-controlled toy Warthog was one of the first Xbox 360 Avatar accessories available after the August 11, 2009 dashboard update that introduced Avatar accessories. It is available from the Xbox Live Avatar shop for 320 Microsoft Points, under Halo 3: ODST-themed accessories. In Halo 3, Halo 3: ODST, and Halo: Reach, the Warthog's tires are printed with the word PUMA. This is a reference to an episode of Red vs Blue's in which Simmons and Grif argue with Sarge about whether to call the vehicle a Puma or Warthog. The Halo 4 Warthog is featured in Forza Motorsport 4. It is not drivable in game, though it appears in the Autovista mode where players can examine various details of the cars. The Warthog descriptions feature narration by Cortana. It is unlocked by unlocking all other non-DLC cars in Autovista. The developers considered adding the Warthog as a drivable vehicle, but due to Forza's focus on technical accuracy, the Warthog would have been difficult to implement due to its large size, unusual 4-wheel drive mechanics, unusual tires, and the various fictional technologies employed. The scout Warthog can be more useful in combat if one player stands on the back of the Warthog with a turret. This can provide for a makeshift Warthog with more powerful turrets. Although similar in both name and design, it is not related to the real life HDT Global Storm Search and Rescue Tactical Vehicle (SRTV-6) 'Warthog'. A render of a Warthog in Halo: Combat Evolved. The Warthog's dashboard in Halo: Combat Evolved. A render of a Warthog in Halo 2. 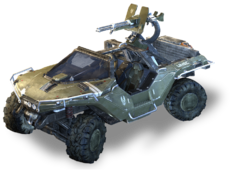 A render of the Warthog in Halo 3. The Warthog's dashboard in Halo 3. The M864 Arctic found on the multiplayer map Avalanche in Halo 3. A scout Warthog in Halo Wars. A platoon of Warthogs performing reconnaissance on Harvest. Various Warthog models in Halo: Reach. A turretless Warthog in Halo: Reach. A rough model of the Warthog, used in background battles. "Puma" written along the rim of a Warthog's tire. A formation of Warthogs leading an assault against Covenant forces during the Fall of Reach. The Warthog's dashboard in Halo: Reach. The Halo 4 Warthog as it appears in Forza Motorsport 4. The Warthog's dashboard in Forza 4. View of the Warthog's tusk-like tow cable in Forza 4. The Warthog's liquid-cooled hydrogen-injected ICE engine Forza 4. Concept art of John-117 sliding over a Warthog's canopy in Halo 4. A working model of the Warthog in Halo 4. A concept model for the Warthog's dashboard in Halo 4. The Warthog's dashboard in Halo 4. The M12B in Halo 4. Warthogs in Halo 2: Anniversary. A Warthog in Halo 2: Anniversary. A Warthog without a turret in Halo: Spartan Strike. Warthogs on an assembly line in A Hero Falls. The M12B Warthog in Halo 5: Guardians. A Raijin-clad Spartan-IV driving a #550 Scuderia StarSpeed M-12R on Raid on Apex 7. A Warthog in Rocket League. Turret-less Warthogs aboard the UNSC Spirit of Fire in 2559. Concept art of the John Forge's Warthog for Halo Wars 2. Concept art of the Flood using a Warthog for Halo Wars 2. Blitz card of a Flame Warthog in Halo Wars 2.